Mr. Rangel was raised in Corpus Christi, Texas. 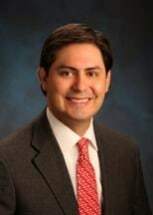 After graduating from law school in 2001, he clerked for the Honorable Hayden W. Head, Jr., United States District Judge for the Southern District of Texas, Corpus Christi Division from the Fall of 2001 to the Spring of 2002. From 2002 to 2006, Mr. Rangel practiced complex multidistrict litigation in Houston, Texas. During that time, he litigated cases across the country involving defective products. In 2006, he joined the Rangel Law Firm and entered into practice with his father. Mr. Rangel has litigated cases through trial on both sides of the docket, in both state and federal courts. Mr. Rangel's trial practice focuses primarily on complex energy and business disputes pending in South Texas courts. In the oil and gas context, Mr. Rangel has handled disputes involving breach of contract, lease termination, deed construction and reformation, declaratory judgment, trespass to try title, payment of royalties, surface damages, failure to develop, fraud and negligence. Mr. Rangel has also negotiated numerous transactions on behalf of South Texas land and mineral owners, including oil and gas leases and amendments, pipeline right of way agreements, surface use agreements, water use agreements and seismic agreements. Mr. Rangel has handled cases throughout South Texas, including Nueces, Brooks, Jim Wells, Kleberg, Jim Hogg, Duval, Kenedy, Zapata, Dimmitt, Maverick, La Salle, McMullen, Frio, Atascosa, Live Oak, Bee and San Patricio Counties.